Growing up, Kaylie Flynn was shuffled from foster home to foster home before being welcomed into Winton and May Wise’s family. It was May who taught Kaylie the comfort of home, and the healing power of baking the perfect brownie. 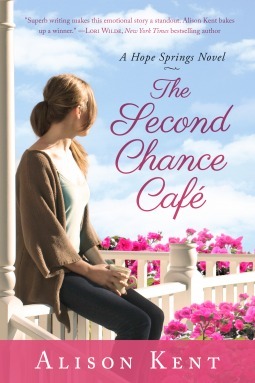 Years later, May leaves Kaylie the money she needs to open her own cafe in the charming Victorian they once shared. Now back in Hope Springs, Kaylie’s determined to finally make all her dreams a reality—and unearth answers to lingering questions about her past. Soon, however, Kaylie’s carefully laid plans take an unexpected turn. The house needs far more work than she realized, and Tennessee Keller, the carpenter Kaylie hires, is proving to be a very handsome and very unneeded distraction from her quest to uncover the truth about her parents. When a crisis threatens to destroy everything she’s worked so hard to build, Kaylie must decide where her heart lies: with the ghosts of her past or the love and promise of her future. I read Alison Kent’s Love in Bloom a while ago, and loved it. So when I read about this one on her blog, I knew I had to read it. And, I got to read it early, since I received a galley through Netgalley. Am I glad I read it? Oh yes. The setting of Hope Springs felt believable. It was small, closeknit and the citizens supported each other. But, I also liked the fact there were secrets. One of the thing that annoys me the most in contemporary romance novels is when everyone know everything about everybody, which is unrealistic. This was a heartwarming story, about healing past scars. All the characters had scars and secrets. It was touching to watch how Ten and Kaylie struggled with their scars, and how it affected them. But gradually, they started to tell each other about what had happened in the past, to each other and to their friends. I liked the secondary characters. They had their secrets, and had made their mistakes. What I especially liked, was how their secrets affected the plot. The plot was filled with unexpected twists. The transformation of the Wise/Coleman’s house into a cafe felt believable. From how Kaylie listen to Ten’s suggestion to how they discovered problems that delayed them. I liked the fact that a lot of the plot twists stemmed from the secrets the characters had. But I also liked the fact that they struggled with their decisions, and knew they would have consequences. That said, one thing I missed in this book was that their HEA never felt threatened. It is possible that it was affected by the fact that I read this on my phone, since I tend to skim more on my phone.